Being Extraordinary in the Age of the Entrepreneur. Acknowledging the great irony that most of today’s aspiring entrepreneurs are following the crowd instead of doing what innovative leaders like Richard Branson, Mark Zuckerberg, and Elon Musk did to become successful, Silicon Valley management consultant Steve Tobak delivers some truth: Nobody ever made it big by doing what everyone else is doing. Drawing on decades of personal experience with hundreds of successful CEOs, VCs, and entrepreneurs, Tobak shatters popular groupthink on the tech revolution, exposes popular myths masquerading as common wisdom, and shows what it really takes to break from the crowd and become a real leader in today’s competitive world. "Steve Tobak's book gets it right about leadership and all of its challenges. Definitely worth reading." "Anyone interested in running a company—high-tech or otherwise—will treasure Steve Tobak’s book. It provides new insights that clearly spell out what it takes to be successful in a competitive world. This book will be immensely useful to both first-time and seasoned entrepreneurs!" "The media-hyped tsunami of entrepreneurship is creating a drought of true innovation and leadership. Is this business book heresy? Nope. Just real insight and clear thinking from Steve Tobak—a highly successful business executive, entrepreneur and damn good writer who knows of what he speaks. Steve gets it right and tells it straight. 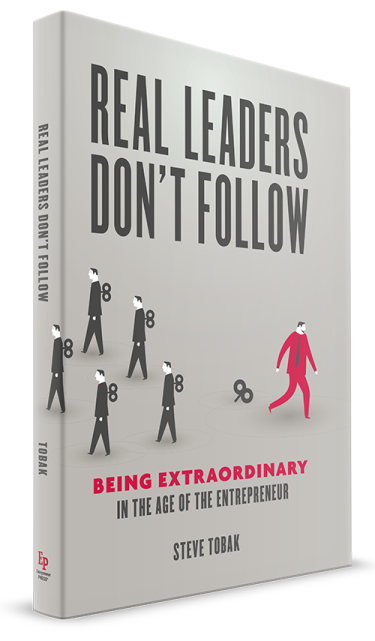 Real Leaders Don’t Follow is an extraordinary read that no aspiring entrepreneur or business leader should do without." Jim McCann, Founder and CEO of 1-800-FLOWERS.COM, Inc.
"Steve covers a wide range of topics on entrepreneurism, business building and leadership in Real Leaders Don’t Follow—and you’ll appreciate the way he consistently takes a strong position that will have you reflecting on and challenging your own core beliefs. Every emerging or veteran leader can take away powerful lessons from this book to apply on their own journey." "This book is spot-on for today's business climate. Steve’s incisive analysis of the 'wantrepreneur' craze is a refreshingly honest, well-informed read. If you're looking for a solid guide to inform business decisions – not only for tomorrow's entrepreneurs but for anyone wanting practical, valuable advice – pick it up." For press inquiries regarding Real Leaders Don't Follow, please contact steve@stevetobak.com.